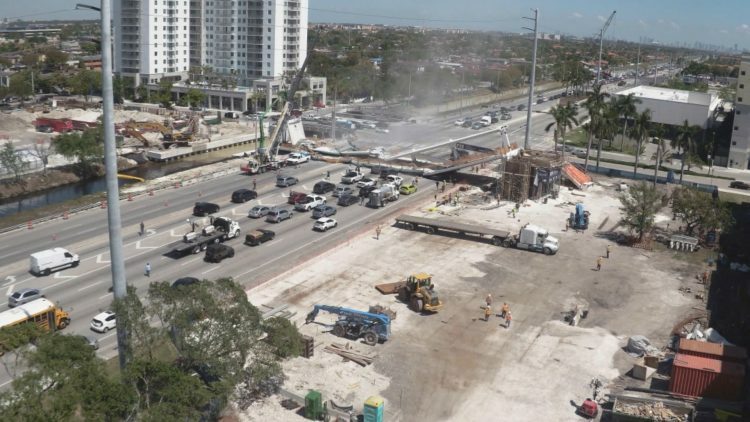 Designers overestimated the strength of a critical section of a Florida International University pedestrian bridge that collapsed, killing six people, and they underestimated the load on that same section, federal investigators reported Thursday. Cracks that were observed in the bridge before it collapsed were consistent with those design errors, their report says. However, the investigation continues, and the National Transportation Safety Board did not blame those errors for the March 15 collapse in the two-page investigative update . The agency is expected to finish its investigation into the cause of the catastrophe next year. Experts from the Federal Highway Administration reviewed the construction plans and design calculations for the 174-foot-long span intended to link Florida International University with the neighboring city of Sweetwater. The cracking documented in the weeks before the collapse was “consistent with the identified errors,” the report said. Photographs of those cracks previously released by the NTSB showed that they grew significantly larger after the prefabricated bridge was moved from a casting yard and set into place over a busy highway and a canal. “The investigation continues to examine the design, review, and construction processes as well as the actions taken once the cracking was observed,” the report said. The report also said concrete and steel samples from the bridge met the minimum requirements specified in the project’s plans. Two days before the collapse, an engineer with the design firm, FIGG Bridge Group, left a voicemail for Florida Department of Transportation officials to report cracking had been found at one end of the concrete span, but the company did not think it was a safety issue. State officials did not hear the voicemail until after the collapse. University officials said DOT officials had been included in a meeting to discuss the cracking hours before the collapse. FIGG released a statement saying the company is still working with the NTSB and that no probable cause conclusion should be drawn from the update. FIU emailed a statement from Kenneth Jessell, senior vice president for finance and administration and chief financial officer. It said the university continues to fully cooperate with the NTSB and hopes the investigation results will help bring closure to the victims’ families and loved ones. Representatives for Munilla Construction Management did not immediately respond to requests for comment Thursday. The university had celebrated the bridge, scheduled to open in 2019, for its accelerated construction method that was supposed to reduce risks to workers and pedestrians and minimize traffic disruption. When the bridge fell, construction was behind schedule and millions over budget, partly due to a key change in the design and placement of a support tower at its north end, according to documents The Associated Press obtained through a public records request. Bridge engineers who reviewed photographs of the collapse for the AP said it was ill-advised to move the tower after completing the initial design, but more analysis was needed before it could be known whether this caused the collapse.